Adam Shires is a Melbourne based artist who is inspired by the depth and fragility of life. He chooses to reflect this through the medium of charcoal, and tries to capture lifetimes in a single image. The preservation of these moments and the sheer incredulity that they will never happen again – ever – anywhere in the universe are what drive him. Through his art he connects the past to the present and conserves these moments to share with the world. ​Having been an ardent drawer since a very young age he’s always been fascinated with the symbiotic relationship of perception, imagination and preservation. Upon discovering charcoal in high school, he fell in love with the vast spectrum of emotion one could create through the medium. So began a lifelong romance with this simplest of substances. Through carbon we capture the memories of carbon life and preserve them for an eternity of viewers, a reflection on the legacy of ourselves. Adam brings his first ever solo exhibition – People of the Pavement – to Meat Market from 1 – 12 April. We caught up with Adam to chat about his career, great influences in his art, and what to look out for in his exhibit. Adam! Tell us a little about yourself! I’m a self-taught artist who has always been drawn to the emotion of black and white. I initially came across charcoal in high school and have been in love with the depth of contrast and feeling you can generate with it ever since. Some of my inspirations came from artists who worked for citadel miniatures producing dark, pencil artworks of fantasy characters. I have since been heavily influenced by many other artists from differing periods, from Caravaggio to Pissarro, Duchamp to Dali and more recently other projectionist artists such as Robert Longo. I feel that the use of digital images in my work establishes a connection between the modern and the traditional. What brought about ‘People of the Pavement’ – what inspired you or what’s the story behind homelessness in Melbourne? I’d been living in Europe for about 3 years developing my style and playing with composition. 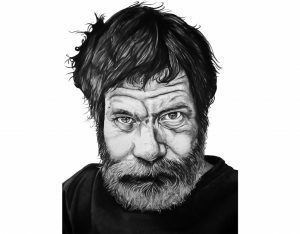 During that time, I produced three portraits of homeless individuals amongst a number of other pieces. Upon returning to Melbourne in 2017, I was struck by the significant number of people I found living on the streets, and I wanted to do something about it. With the three pieces I already had in my collection it was easy to see what I needed to do. 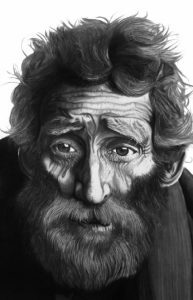 Using art as my voice, I figured I could help the homeless community by raising awareness of their issues, and also money, to help them in their struggles. This is your first solo exhibition – what does a curator like yourself need to consider to make a successful space? The whole project has been an interesting learning and growth experience. I have had to learn to project manage everything from the ground up; the art is just one small thing in a much larger machine. From marketing, networking, transport logistics, photography, printing and even video editing to insurance cover, media releases, crowdfunding and seeking donations – every facet of the larger project has unveiled smaller things I’d not even considered in the initial stages. One thing that helped me understand the project in more bite-sized sections was applying for the VicArts grant. Unfortunately, my application was unsuccessful, but it taught me so much about what goes into a project of this scale, and how to (hopefully) make it a success. Is there a particular work in this exhibition that stands out to you, or is a flagship piece? I’m really pleased with all the pieces, but if I had to choose one, in particular, I think it would have to be ‘Siesta’. It is one of my favourites. The composition of the subject and the multitude of different textures involved in drawing it was at times both a challenge and a joy. I am extremely happy with the result and feel it really captures the essence of the exhibition. What will you be working on next? Is there a subject or piece that you’re working on, or plans for what you’re moving onto next? I think I’ll be working on taking a bit of a break after the exhibition. I’m hoping to get away to Europe for a few weeks to visit family and friends while also seeking some inspiration for the next exhibition. I haven’t thought of touring the exhibition but could be interested in the idea if I get some interest in supporting it. If you could say one thing that everyone in the world could hear, what would you say? To create is the biggest gift of all, so let’s create something big for all of us. Ars longa, vita breivs. People of the Pavement is on display at Meat Market Stables until 12 April. Free admission. 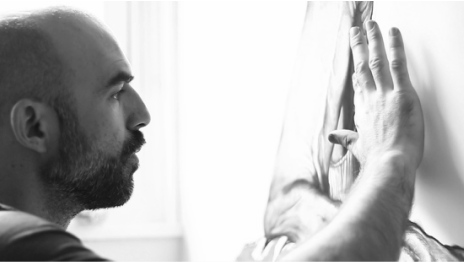 Discover more about Adam Shires Original Artwork on Facebook and Instagram. Original artworks on this page by Adam Shires.